Parksville Tailors & Leather Work offers the highest quality workmanship & tailoring for suits or tuxedos, shirts, leathers, casual wear, wedding gowns, bridesmaids, prom dresses, and more. Why is it important to go to an experienced tailor? Regardless of what some of those tags in the backs of our clothing say, one size does not fit all. No two people's bodies are exactly alike, even if they wear the same size. This is precisely why it is important to seek the services of a great tailor! Parksville Tailors and Leather Works can take a garment that fits OK and, make it look and feel as thought it were custom made for you. Having your clothing tailored to fit is well worth the investment, because if it doesn't fit properly, how can you look and feel your best. 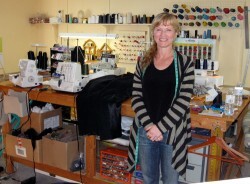 Call Parksville Tailors & Leather Work, your local professional tailors.